Tom Brady had a triumphant homecoming over the Bengals last week. In Week 7, he's got a much tougher matchup on tap as the Patriots travel to Pittsburgh and take on the Steelers, sans Big Ben Roethlisberger. Let's break down the matchups and figure out who to start and who to sit this week. It was another easy win for Brady against Cincinnati, as he racked up 376 passing yards and three aerial scores. The Pittsburgh D, while historically good, has been anything but this year, and they just gave up 30 points to the lowly Dolphins. Expect another big week for the future Hall-of-Famer--start him if you've got him. The Steelers lost their franchise QB to a torn meniscus last week, meaning that backup Landry Jones will have to lead the team against New England. Considering that he only threw one pass in relief before Big Ben came back in Miami, there's just not enough information to say he'll do well. Take the chance if you want, but his receivers will have to make big plays if Jones is to do well. Unless you're in a big league and thin at quarterback, pass on him this week. LeGarrette continues to deliver Blount force trauma to Pats opponents week after week, and there's no reason to think he'll slow down. Jay Ajayi just gashed Pitt for over 200 yards and 2 TDs, and Blount is far more powerful than Ajayi. He gets upgraded to an RB1 this week. The Steelers have their own premier back in Le'Veon Bell, and he remains startable. Though New England limited Gio Bernard and Jeremy Hill, Bell is in a different class altogether--and he's potent as both a runner and a receiver. Keep him in your starting lineup and don't sweat it. 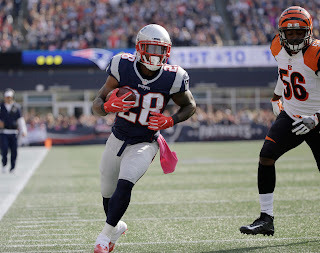 Beyond the two feature backs, the Pats' James White has a chance to produce through the air against the Steelers D, which has given up big receiving yards to running backs like Darren Sproles. He's a flex option here, especially in larger outfits and PPR leagues. Where should we start? Together, these two teams feature some of the best talent at wideout in the league. Both Julian Edelman and Antonio Brown, the #1 receivers, are in line for good fantasy days, and there's startable talent beyond them as well. For the Pats, Chris Hogan has emerged as a legitimate deep threat, making him a flex-able player, and Pittsburgh's Sammie Coates is one of the fastest players in the league, having already caught multiple 50+ yard TD passes this year. If he can fix nagging issues with drops, he could also fit in at the flex. Beyond that, it's a crapshoot. 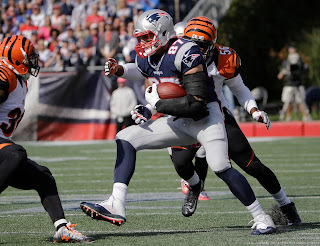 Danny Amendola and Darrius Heyward-Bey can be relevant, but they both need TDs to produce. Take the risk on Amendola if you want, but keep Heyward-Bey planted on your bench against the Pats. The Patriots' dynamic duo is back at it again, and they can both produce against a thin defense. However, Gronk's return has significantly eaten into Martellus Bennett's production--without TDs, the veteran has fewer opportunities to snag receptions and yards. Start him as well, but be cautious: he's only around the top seven this week. For Pitt, Jesse James has been a pleasant surprise, and the big target should see plenty of looks from Landry Jones, especially in the red zone. He's riskier than the Patriots duo, but he has a high ceiling and a good matchup--New England hasn't been great at defending tight ends this year. 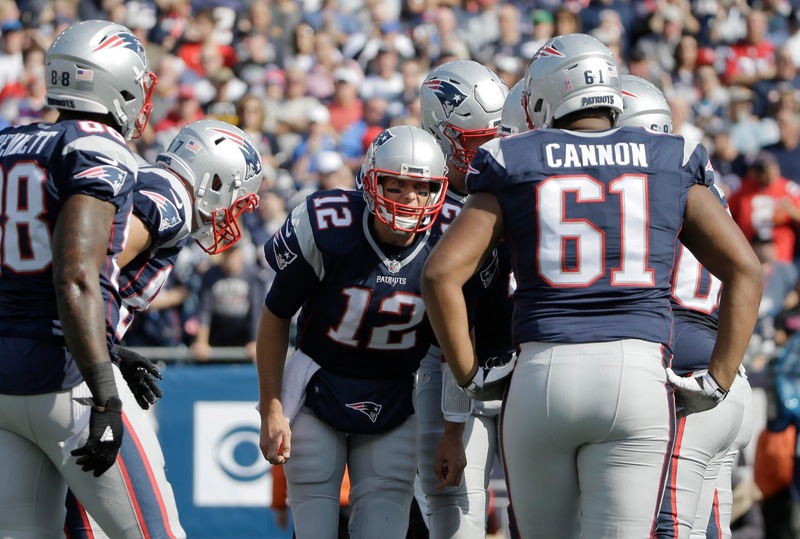 While the Patriots are on the road and paper-thin at linebacker (Jamie Collins, Shea McClellin, and Jonathan Freeny are all injured), they're facing a backup QB and a team with a penchant for blowouts--both wins and losses. There's some risk involved, but feel comfortable starting them. The Steelers D, like most defenses going up against the Patriots, is the opposite. They're coming off a bad performance, facing the most complicated offense in the league, and will have to compensate for a backup quarterback. Find another option this week. As far as kickers go, Stephen Gostkowski is looking worse and worse as the weeks go on--he's already missed three field goals and shanked an extra point on Sunday as well. He's still acceptable, but keep him on a short leash, and don't be afraid to package him in a trade. For Pittsburgh, Chris Boswell is only 4 for 5 on the year--a combination of average accuracy and low volume makes him a tough sell against the Pats.